Séamas — ainm pearsanta (< an Rí Séamas I Shasana); 'The earlier designation was Béal Átha Cille Srianáin, or perhaps Baile Cille Srianáin ... Lughaidh Ó Cleirigh understood the name as Trénán. This in fact is the correct form of the name' P. Walsh, Irish Leaders and Learning 299-300. Séamas — personal name (< King James I of England); 'The earlier designation was Béal Átha Cille Srianáin, or perhaps Baile Cille Srianáin ... Lughaidh Ó Cleirigh understood the name as Trénán. This in fact is the correct form of the name' P. Walsh, Irish Leaders and Learning 299-300. - · Nóta "“This town was built by Sir Charles Coote AD 1622, at the charges of King James from whom the town in named… The town hath 200 acres under its liberty; the town and land belong to the Earl of Mountrath. The part of the town without the North gate belongs to the Bishop of Ardagh formerly called Killshreenane though now vulgarly reputed part of the Corporation” (Journal of the Ardagh and Clonmacnoise Antiquarian Society, Iml. 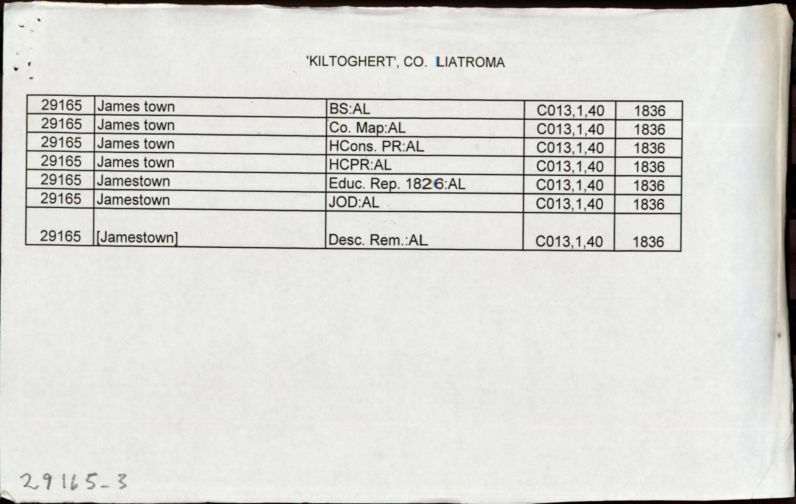 1, Uimh.3, c.1931/2, lch 40) "
- · Nóta 253-4. 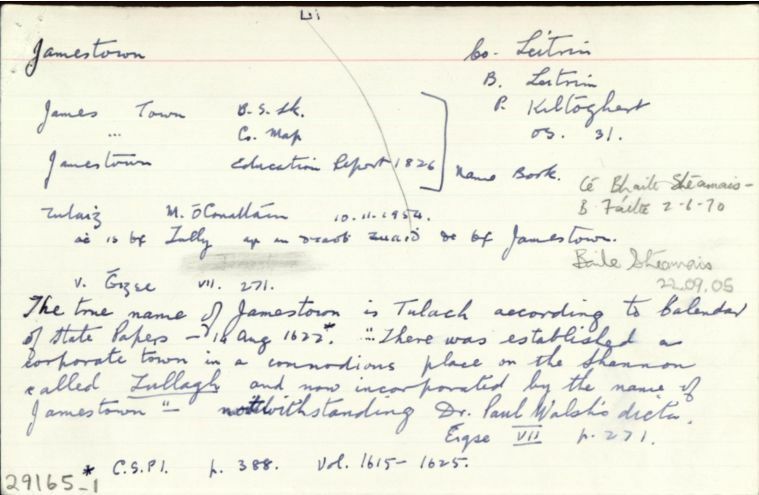 The true name of Jamestown is Tulach according to Calendar of State Papers – 14 Aug. 1622 “There was established a corporate town in a commodious place on the Shannon called Tullagh and now incorporated by the name of Jamestown” – not withstanding Dr. Paul Walsh’s dicta. - · Nóta "Éamonn Ó Tuathail, Éigse VI: 253-4. The reference is to Baile Shéamuis, Jamestown, which was so named “in hounour of James I,” PG. Its old name was Cell Srianain, Annals of Ulster, iii, p.360; Misc. Annals. P. 138. In 1595 Red Hugh O’Donnell led his army across a ford here, Life of Hugh Roe O’Donnell (ed. Rev. D. Murphy), p.80. “The Shannon at Jamestown suddenly passes from the character of a broad and deep river to that of a shallow, rapid ang unnavigable stream,” PG, s.n. Jamestown. A longer form of the name is ‘Beallakillesrenan’ (= Béal Átha Cille Srianáin? ), Hardiman, 348. 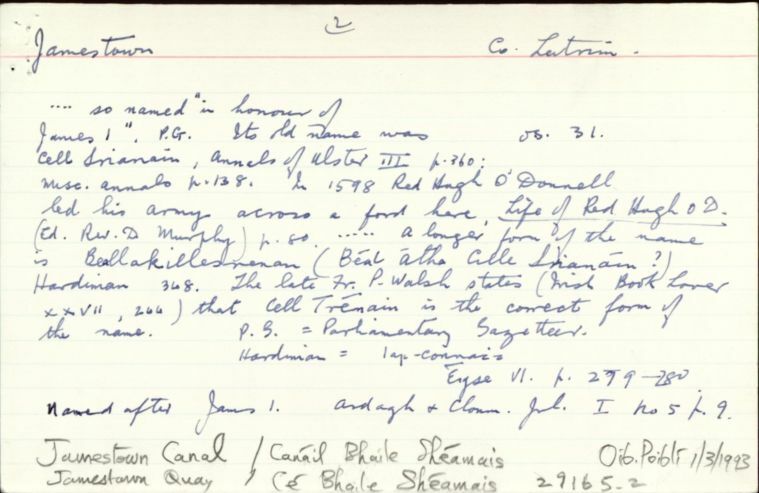 The late Father P. Walsh states (Irish Book Lover xxvii, 244) that Cell Trénáin is the correct form of the name (279-80). " - · Nóta "Pinkman (Féach ar an mbileog bhreise) "
Jamestowne is a walled towne, the Bawne is an English mile in compasse... built A.D. 1622. The parte of the towne weout ye North gate, to the very gate.. formerly called Kilshreenane; Killshreenan church is weout ye wall to ye norte.